Guerlain Les Parisiens Chamade Homme Eau de Toilette, 3.3 oz. GuerlainLes Parisiens Chamade Homme Eau de Toilette, 3.3 oz. Some fragrances are like love stories. Passionate and fleeting, wild and torrid. You and me, so happy together, for a few hours, a few day... Happy apart, happy to have this distance that whets the pleasure of seeing each other again. What a delicate harmony. A fragrance like love can indulge in anything. 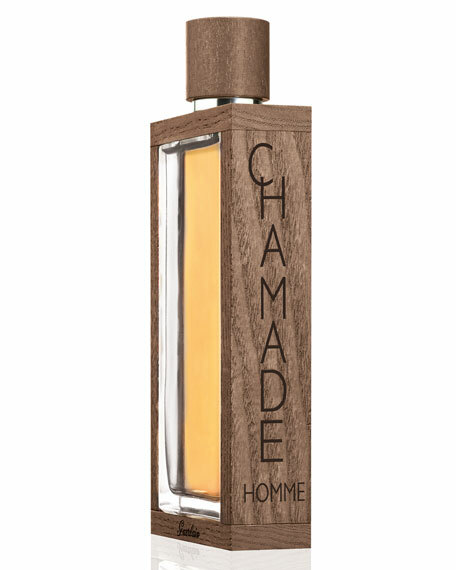 The Chamade pour Homme fragrance is showcased in a bottle with clean lines, simply framed in wood for a terribly contemporary allure. Top notes: Italian bergamot, black pepper. Heart notes: hyacinth, violet leaf note, nutmeg. Base notes: vetiver, leather, precious wood. 100 mL / 3.3 fl. oz. For in-store inquiries, use sku #1933379.